A Filipino couple working overseas return to their hometown to get married. But a deadly curse follows the couple, based on the superstition that marriage should not take place within a year of the death of an immediate relative. 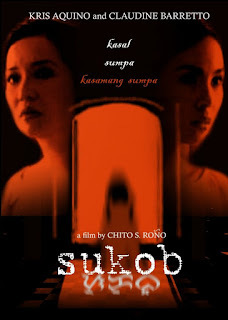 Sukob is a 2006 Filipino horror film starring Kris Aquino and Claudine Barretto. The movie was directed by Chito S. Roño who previously worked with Aquino in the 2004 hit horror film Feng Shui. Sukob is considered as the highest-grossing Filipino film of all-time earning PHP 203 million until in 2009 when it was surpassed by the romance film You Changed My Life in box office. The film's premise is based on a Filipino superstition in which one should not get married in the same year an immediate relative dies or is married or no siblings should be married within a year.